A beautiful, unpretentious acoustic/electric hybrid, which offers excellent value and playability and a mix of classic electric and highly convincing acoustic tones. A must-try guitar. Tonal range; price. Excellent build and design. For some it might be a jack-of-all-trades, master of none. Very smart and unpretentious looking. Fender have obviously aimed to keep this hybrid as 'electric' looking as possible. The Fishman Aura controls are tucked away on the top edge of the body. Fender's new Acoustasonic Telecaster is an innovative hybrid that can produce both electric and acoustic sounds. 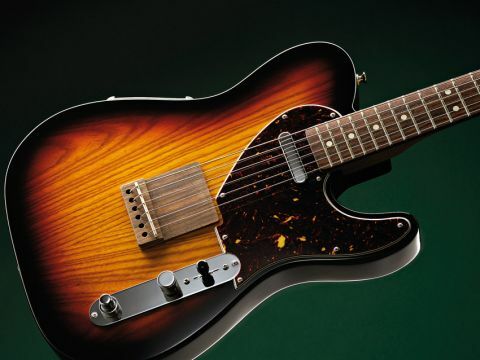 The initial impression is of a regular Telecaster, but dig a little deeper and you'll find a chambered ash body, acoustic-style rosewood bridge, a Custom Shop single-coil and Fishman's Aura technology. Outwardly, it appears Fender has made very deliberate attempts to keep the new Acoustasonic as 'electric' looking as possible: the rosewood bridge is in the style of a standard Tele bridgeplate and the Fishman Aura preamp (which controls the acoustic side) is tucked away on the top edge of the guitar. "It offers acoustic picking to melow jazz and blues soloing - all without the worry of troublesome acoustic feedback issues." The beautifully grained, lightweight, two-piece ash chambered body is finished here in a three-colour sunburst that blends nicely with the Thinline-style tortoiseshell scratchplate. The body hides a unique feature: a wedge-shaped spruce centre-block designed to increase resonance for an improved acoustic experience. The all-maple neck is more traditional: a comfortable-feeling modern 'C' profile paired with a modern Fender 241mm (9.5-inch) fingerboard radius that provides a great platform for versatile bending and intricate chord work. A Fishman transducer pickup is mounted underneath the compensated plastic saddle of the rosewood bridge. The onboard Fishman Aura IC preamp features two standard preamp controls, volume and tone, and also enables you to select four Aura IC images - dark folk, bright folk, dreadnought and jumbo. On the magnetic side we get Fender's Custom Shop Twisted Tele pickup at the neck, and controls comprise master volume and a stacked volume and tone for the magnetic pickup. A three-way lever selector switch offers piezo acoustic, both piezo and magnetic or electric alone; the supplied stereo 'Y' cable allows either dual 'stereo' outputs for both systems or mixed mono (selected via switch on the back of the battery compartment). It's strung with 0.011 to 0.049 strings (with a wound third), anchored through the body in the usual Tele fashion. Unplugged, the Acoustasonic has ample projection and it's certainly more acoustic-y than a standard solidbody Tele. Played through an AER acoustic combo, the dark folk image creates a crisp and clean flattop tone with ample presence. Roll off the treble from the preamp and it works for smooth jazz styles too. Bright folk, somewhat oddly, has noticeably more low-end than the dark folk image, but with a healthy amount of bloomy resonance it gives you a convincing folk singer-songwriter style plucked and strummed tone. The dreadnought image is more evocative of a specific body style - wide sounding and well balanced across the frequency range, perfect for uncluttered strumming and more attack-heavy styles. The jumbo image is a little bit darker than the dread, but it has good sustain and a more muscular bass response - it sounds particularly sweet in DADGAD. The Twisted Tele is one of our favourite Fender pickups: it's rich, articulate and suits a wide range of popular music styles - from blues and jazz, to rock and pop. Combining the two systems throws up a whole range of new and interesting tones, however. A favourite is the bright folk image, Twisted Tele pickup and a slight amount of valve amp gain from our Budda Super Drive test amp. Here you experience an almost three-dimensional, rootsy tone that's perfect for airy sounding jazz or blues with a little bite to it. If you add a little bit of volume, you get an open and expressive mild-rock sound. Either way it's a lot of fun. Balancing the acoustic and electric outputs takes some tweaking but once there, you're able to skip between rhythm and solo sections - think of songs by The Eagles, Springsteen and the like to get an idea of where that can work. All up, you're getting access to articulate fingerstyle sounds, big strummy washes, then mellow jazz and blues soloing - all without the worry of acoustic feedback. This is a truly musical and inspiring instrument that combines good value with impeccable build-quality and a range of highly engrossing hybrid tones. It would feel just as comfortable in the hands of a touring rock player, as it would a busy function jazzer or dreadnought-toting singer-songwriter. If you want a guitar that can handle strummy acoustic and mellow electric, plus a whole new twist on cool blues and jazz tones, this will be just the ticket.